A wind streamer mounted in front of the tractor will help to show the operator which way the wind is blowing and its likely force. It will help you to know when to be extra cautious and maybe react with coarser nozzles. Plan ahead for any emergency and try to anticipate problems. For example, if the wind speed is currently acceptable but is forecasted to rise then consider spraying the downwind swath edges first. Never try and do maintenance with spray liquid in the tank and in the field. 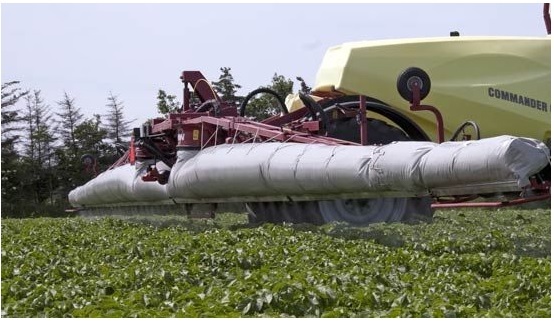 Escaped spray liquid will soon apply a huge excessive dose that can run-off and contaminate water within the soil or adjacent to it  or cause a sterile area of soil to be formed that will remain for many years. Avoid over spraying for it is wasteful and puts your crops at risk as well as posing a hazard. Use the boom section valves for areas, which are less wide than the swath. If treating an angled field it is worth the effort to turn on off the boom sections as the boom passes over the already sprayed area close to the headland. HARDI TRIPLETS have an off position for you to use if you need to control swath widths by 20 inch sections; in particular, when next to water ways.